The Smycms once again on top form with Bugsy Malone, the gangster caper normally played by kids, but tackled head on by the big kids (you know who you are). Filled with great songs written by Paul Williams and bursting at the seams with minor characters from Babyface and Looney Bergonzi to Pickett and Lena Marelli. Oh I nearly forgot, it also includes the dreaded Splurge Gun, just how much fun can a person take. New York 1929, a war rages between two rival gangssters, Fat Sam and Dandy Dan. Dan is in possession of a new and deadly weapon, the ‘Splurge Gun’. As the custard pies fly, Bugsy Malone, an all round nice guy, falls for Blousey Brown, a singer at Fat Sam’s speakeasy. His designs on her are disrupted by the seductive songstress Tallulah who wants Bugsy for herself. BUGSY GANG GET JUST DESSERTS, Bugsy Malone, Church Hill Theatre, ***, Barry Gordon, Edinburgh Evening News Wed 14th April 2010. ” the Smycms group seem to work best when things don’t go according to plan. Sure, the “New Yoik” accent was more North Leith than Lower East Side Manhattan in places, but when actors and audience are having just as much fun as each other, who really cares”. 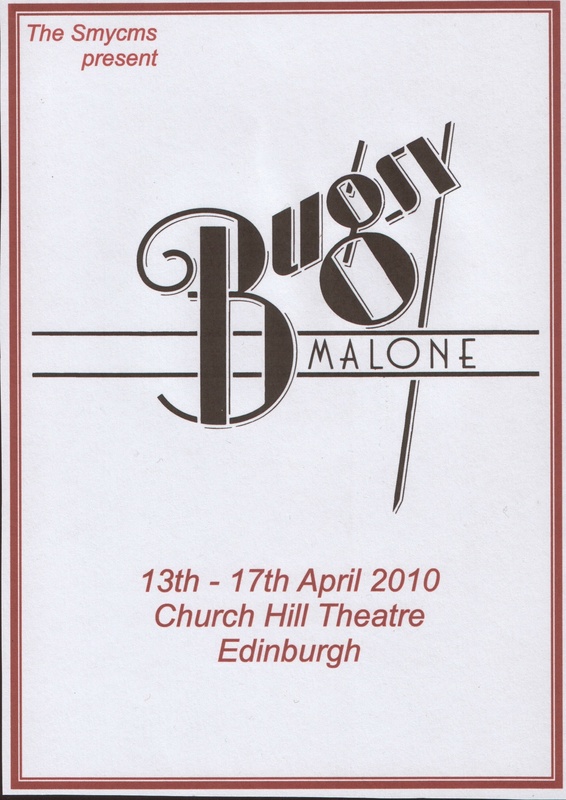 The Production of Bugsy by an adult company is always going to be difficult to pull off, not least when it is performed by a school as they have a bottomless pit of smiling enthusiastic kids to play all of the minor characters, numbering upwards of 45, then throw in the 16 main characters , boy do you have a busy backstage. This all means you have to double up characters or even triple up and in some cases quadruple up when you only have a small cast. It does mean that there are plenty of quick changes from one costume to the next character, with some of the cast wearing three costumes at the same time. This would ultimately be Laura Jordan Reed’s last production, after 14 years she took the difficult decision to bow out as Artistic Director for The Smycms (nothing like going out on a high) she felt the time was right to call it a day on a remarkable 14 years as Director of one of Edinburgh’s leading Am-Dram companies. Her first show as Director was Carousel in 1997 and what a great job she did, this was followed by another old faithful, Fiddler On The Roof 1998 which again proved what a great director she is. Then Smycms decided to push the boat out and do Crazy For You 1999, this was an Edinburgh Amateur premiere and would surely test Laura to the max….Well it was another great show, ” a deliciously entertaining show” reported the Edinburgh Evening News. For the next 11 years anything that was given to Laura, be it a not so well known show, The Music Man 2002, “no hard sell needed for sparkling show” Drew McAdam Evening News, 0r a standard, Singin’ In The Rain 2003, “ambitious idea proves to be a thunderstormer” Thom Dibdin Evening News, or even an unknown quantity, Red, Hot And Cole 2008, ” quoting Porter himself, the show is the top! “, Martin Couper Evening News. Laura had the knack of taking a script and turning it int0 a living, breathing thing of beauty that by the middle of show week had taken on a life of its own. So on behalf of the company may we wish you all the best for the future and thank you for all you have done for Smycms over the past 14 years.